Today's Guest blogger - James Van Oppen. I am delighted to introduce our very first Guest Blogger on #ECGccass! Todays case and Twitter feed will be led by James Van Oppen. James is a 4th year medical student and a commissioned officer with the army cadets. His special interests include pre-hospital emergency care, mountain leadership and expedition skills. So - with much appreciation and thanks - I will now hand over to Jamie. The practice nurse has called you to see a new patient who is particularly uncomfortable on arrival for her flu jab. Running late, the 75-year-old lady rushed to the practice and is complaining of “racing heart” and “tight chest”. On further questioning she states that she rarely leaves her house nowadays as she gets so tired and can never catch her breath. Having sat her down and given reassurance, you examine her chest and find her lung fields to be clear. Her pulse is irregular with what sounds like a diastolic murmur. 1. Start with the basics: what is the rate? Regular or irregular? Can you see any acute changes? Using the ‘count the squares’ or ‘3 second marker’ methods, the rate here is about 80bpm. It is clearly irregular. ‘Count the squares’ - Count the number of big squares between each QRS complex. Divide 300 by this number, for a rough rate. ‘3 second marker’ - Measure 3 seconds on the rhythm strip (1sec = 25mm, so 3sec = 15 big squares). Count the number of QRS complexes and multiply by 20 for a more reliable rate when the pulse is irregular. The ST segments in the lateral leads are depressed – why? 2. Rhythm: can you see p waves? What can you say about the axis? I can’t see any p waves! So this is AF. The crude ‘thumb method’ comparing Leads I (negative) and aVF (positive) quickly shows this to be right axis deviation. In addition, that lateral ST depression means this is probably right ventricular hypertrophy – although we are missing the dominant anterior R wave we would expect to see. ‘Thumb method’: Hold your thumbs in the direction the QRS complexes in Leads I (left thumb) and aVF (right thumb) point. Both thumbs up = normal. Left up, right down = left axis deviation (what could cause this?). Left down, right up = right axis deviation (what could cause this?). 3. What other questions might you ask to complete your history? The lady tells you that she has been having problems with her chest for the last decade but never sought advice, as she was too busy looking after her husband. She gets a tight chest pain and shortness of breath on exertion, and has to put her feet up in the evenings to stop her ankles from hurting. On direct questioning, she does remember spending a year in convalescence as a child, when she was too unwell to go to school. 4. What is the diagnosis? How are you going to manage her today? Mitral stenosis most often occurs in patients who had rheumatic fever. Rarely problematic in the age of antibiotics, in the past this streptococcal infection could escalate to chronic colonisation and resulting damage to the valve leaflets. 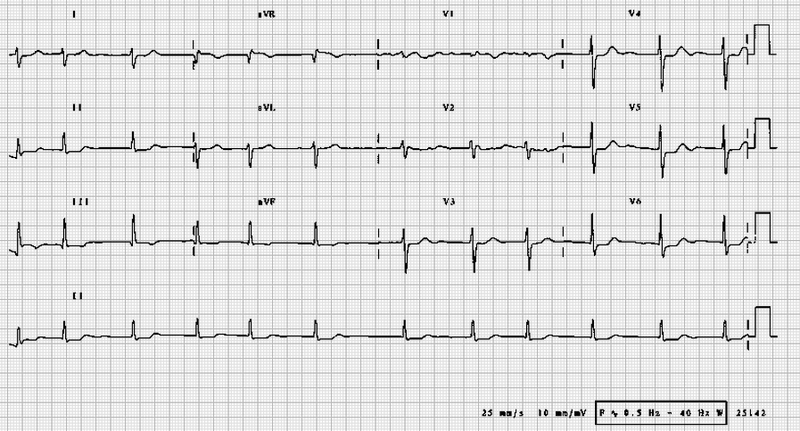 The ECG picture of atrial fibrillation and right axis deviation is typical of mitral stenosis. Clinic-based management is to treat the heart failure and anticoagulate. These patients are at increased risk of infective endocarditis and may require prophylactic antibiotics before invasive procedures. The extent of valvular damage and lumen viability can be assessed by echocardiogram, allowing decisions whether balloon valvuloplasty or valve replacement would be worthwhile. Hope you enjoyed tonights class!